Counting of votes for Madhya Pradesh Assembly’s 230 seats began at 8am on Tuesday. As many as 2,907 candidates were in fray for the November 28 assembly polls as Chief Minister Shivraj Chouhan of BJP is attempting a fourth term in office, while challenger Congress expects to return to power after a 15-year gap. While Chouhan has called himself the “biggest surveyor” in claiming a win for the BJP, senior Congress leader Kamal Nath said his party would get at least 140 seats to oust the saffron party and form a majority government. The state polls saw a voter turnout of about 75%. Madhya Pradesh Chief Electoral Officer V L Kantha Rao told reporters that counting began with the postal ballots at 51 centres across the state, reports Hindustan Times. 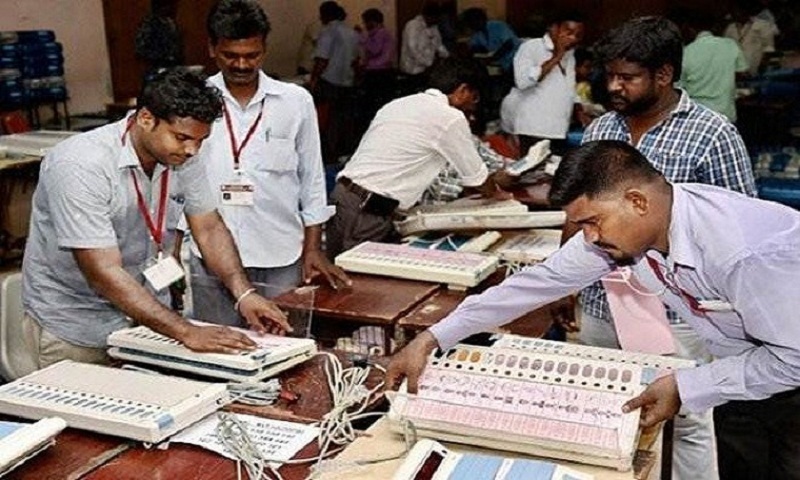 “EVMs (Electronic Voting Machines) would be taken up for counting at 8.30 am. Counting of postal ballots would continue simultaneously,” he said. In Mizoram, counting of votes in the 40-seat Mizoram Assembly polls commenced on Tuesday amid heavy security, a poll official said. Chief Electoral Officer Ashish Kundra said that under a three-tier security cover counting has begun in 40 counting halls in 13 centres across the mountainous state. The polls were held on November 28. “After counting the postal ballots first, counting of votes of EVMs (Electronic Voting Machine) would take place simultaneously for all the assembly constituencies,” Kundra told the media here.